completist that i am, instead of starting in on soul calibur i went back to the very first release of the series, called soul blade for the original playstation. the game was highly praised when it came out, although the series’ first success has since been eclipsed by its hugely popular sequels. i’ve dipped into some of the soulcalibur games a bit, but for the most part i came into this game without too many preconceptions. i hadn’t played any of the tekken (also by namco) games either, and apparently the two series are similar. 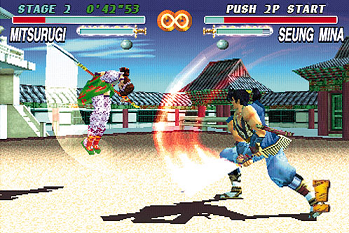 both series were part of the time period when fighters ramped up the difficulties of the street fighter games and also when it became customary to include practice modes and command lists in games. i’ve grown to rather enjoy fighters, and so i didn’t have any problems getting into this one. one thing i found annoying is that you have to use separate blocks for low attacks vs high/mid attacks. another thing that was somewhat annoying is that this was the first fighter where i felt that the button combinations require you to either hold the controller in an unnatural way or get an arcade-type controller. i’m sure many people find it absolutely normal to use an arcade-type controller for a console fighting game, but i’m not into them enough to actually go out and get one anytime soon. anyway, i played through the normal level with all the characters and for the most part found the experience to be enjoyable. the graphics are quite good for the time and have actually aged fairly well, and the character design is also notable. i found that in general the actual movesets ended up not feeling like they had that much variety, although there are some definite exceptions, including voldo and cervantes. i was also surprised there were so many korean characters, which i think is a first for a video game that i’ve played. the game has a weapon gauge where your weapon can break, leaving you to fight with your bare fists, but that mechanic is underused. and i don’t really see the point in the extra weapons you can accrue which for the most part have only minor differences in stats (strength, durability, etc.). the story mode’s challenges added some nice variety, even though the stories themselves weren’t particularly memorable. the only other main complaint i had about the game is that the game puts too much emphasis on knocking down your opponent and then following through with an attack. not being able to immediately recover when you’re knocked down and knowing your opponent is always going to get another hit in just feels like some sort of pointless combo and it slows the game down and makes the pacing of the matches feel jerky. after i played through this game for awhile i tried out soul calibur again and that game has eliminated this long delay after a character gets knocked down, and as a result feels much more responsive and natural. i’ll definitely be exploring that game more in the future, although i enjoyed this one enough to come back to it as well. oh, and if anyone wants to know, i focused on mitsurugi this time around, although i just chose him randomly. he’s pretty cool, but i’m probably not going to continue with him in soul calibur even though it would be interesting to compare the movesets.